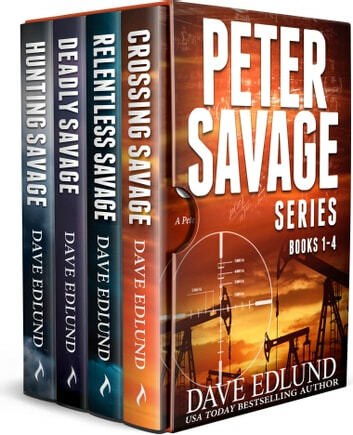 Thoroughly enjoyed reading the Savage books and ordered the next book. Peter Savage gets into more exciting situations than any 5 men. He has friends to help him out of difficult situations but even he can't escape everything. Many twists and turns in plot and action will keep you reading. Any action or suspense fan will really like this series. I found this to be an enjoyable series, although centred around the character of 'Peter Savage' he did not dominate to story line, and there were many other characters playing a major role. I bought these books on a sale for the boxed set. I am hooked. Dave Edlund improves as a writer with every book. He takes an item of truth in each book and expands a fictional suspenseful story. I am looking forward to 'Guarding Savage' in Oct 2018.